Born in 1950, Carol Quinn, a long-time Northern California resident, currently lives and paints in the foothill town of Folsom, California. She specializes in capturing the surrounding natural landscape using oils. Viewing Carol’s art often evokes a strong personal connection for many people, drawing them in with the comforting feeling of familiar scenery or a favorite travel get away. 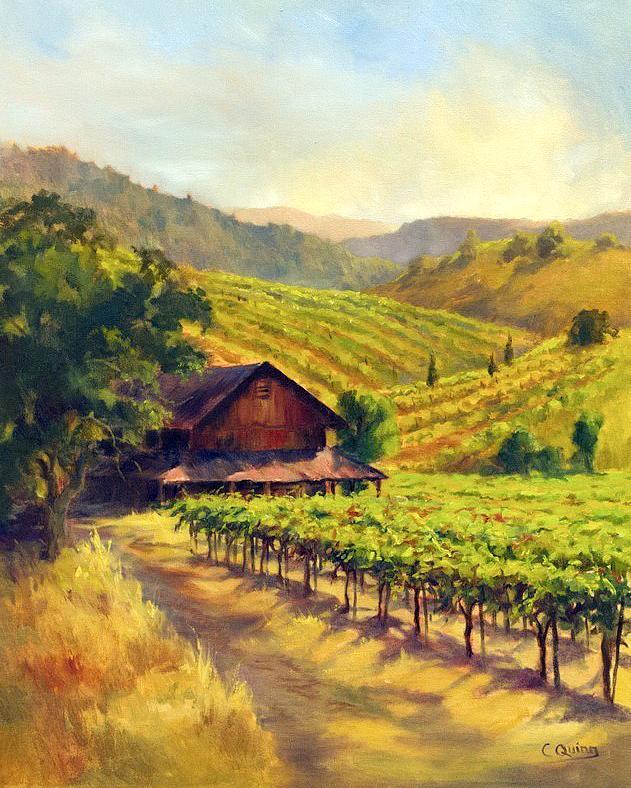 Since moving to California in 1965, Carol has focused almost exclusively on rendering the endless variety of landscapes and seascapes found there. She is consistently drawn to the strong, golden light that transforms everything it touches. Carol remarks that she particularly loves the late afternoon and early evening light when a scene is bathed in a golden or rosy peach glow, this is the magic hour. Her oil paintings are distinguished by the glow of an inner light which makes them come alive. While primarily self taught, Carol has worked with Anita Wolff, Kathleen Dunphy and Mike Bagondonas. Carol states that each of these artists has provided the insights, challenges and tools to help her take her painting skills to the next level. Painting is a lifetime commitment, one that I am fortunate to do. In recent years, Carol has focused on painting the Sierra, Yosemite and Lake Tahoe regions. These areas with their majestic land forms, vibrant color, as well as the varied faces of Lake Tahoe, provide limitless opportunities for new interpretations in oils. She is also drawn to the magnificent, gnarled oak trees set against golden hillsides in the summer or the lush green of winter and spring. Carol feels they are one of the iconic symbols of California. "My goal is to capture the feeling of a particular place and connect emotionally with the viewer to provide a beautiful respite from a busy world," she states. Art collectors have remarked on how looking at one of Carol’s paintings takes them back to a place they visited and renews treasured memories of time spent there. August 2012-Three paintings purchased by Marshall Hospital, Placerville, Ca. June- 2012 Spring Studio Tour, Folsom, Ca. January 2012-“3 x 3” Show-El Dorado Arts Council Gallery-Placerville,Ca. August 2011-45th Annual Mother Lode Show-Placerville, Ca.